The UFC and its fans received the worst possible news on Friday night when it was announced that Daniel Cormier, the UFC Light Heavyweight Champion, was injured and removed from his UFC 197 main event matchup against Jon Jones. Since the announcement came on April Fool's Day, fans were collectively crossing their fingers hoping it was all a big joke or a hoax, but alas, it wasn't, and it sent the UFC scrambling to find a replacement. Jones, who in the past refused to fight Chael Sonnen in a short notice, which led to the cancellation of UFC 151, sent out a video on social media telling the fans he owed them and that he was willing to fight anyone in the light heavyweight and heavyweight divisions. That made things a little easier for the UFC, but it still was difficult to find a replacement opponent for Cormier with the fight just a few weeks away. Not many challengers stepped up the plate, at least publicly. 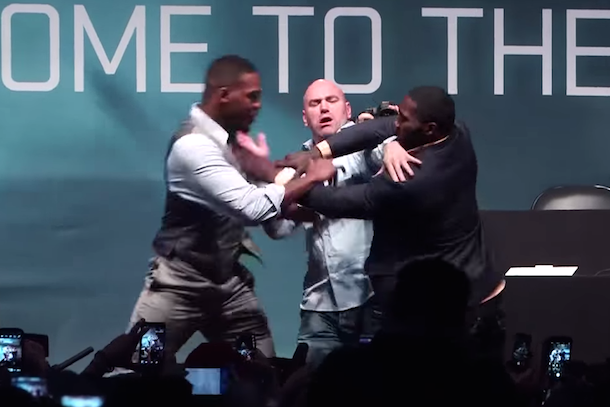 The fight that made the most sense, a fight between Jones and Anthony "Rumble" Johnson, was ruled out due to Johnson recently having a dental procedure that left him unable to fit a mouthguard. Ovince St. Preux asked for the fight, but he hasn't really done anything to deserve a matchup with the top pound-for-pound fighter on the planet. Rashad Evans stepped up to the plate as well, but that's a fight fans have already seen. That's about all the light heavyweights who asked for the fight. A few heavyweights asked for the fight as well. Mark Hunt went on Instagram posting a video saying he would take the fight with Jones. Fan favorite Roy Nelson said on Twitter he would take the fight and make it exciting even though he hadn't been training. Even retired heavyweight Shane Carwin said he would fight Jones. So there were a few heavyweights willing to fight the GOAT. 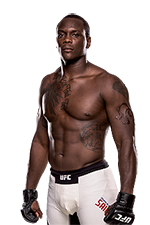 Ultimately, the UFC chose to go with St. Preux, and he will now fight Jones at UFC 197 in the main event for the interim light heavyweight belt. It's a fight that has been met with overwhelmingly negative reaction by the fans, who see it as a mismatch. 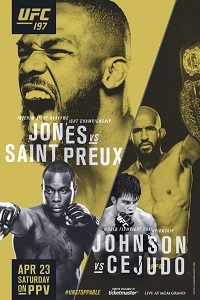 Yes, it's a fresh fight for Jones, but it probably won't last longer than a round considering the style matchup pitting a guy who can't stop the takedown in OSP against an elite MMA wrestler in Jones. Most fans are also disappointed the UFC is introducing another interim title, when DC is only expected to be out a few months with injury. Most of all, what the fight shows is the lack of depth in the light heavyweight division. In almost every other division in the UFC, if a top contender or champ went down with an injury, there would be another fighter or two ready to fill in and make for a highly-competitive bout. But not at light heavyweight, where OSP is ranked #6 by the UFC despite having one top 10 win, a UFC Fight Night 56 victory over a shot Mauricio "Shogun" Rua. The UFC's hands were kind of tied in this case because the division is so shallow. It's not the UFC's fault that 205 lbs is so weak; it says more about the sport itself. But with Jones saying he would move to heavyweight, and with no belt needing to be put on the line, it's a bit disappointing that OSP is the opponent. It's understandable that the UFC didn't want to go with Demetrious Johnson vs. Henry Cejudo as the UFC 197 main event, as that's just asking for a weak PPV number. But OSP vs. Jones isn't a very competitive matchup. Sure, you can say "anything can happen in MMA," but if that's the case, Jones could have fought Gian Villante or Nikita Krylov. 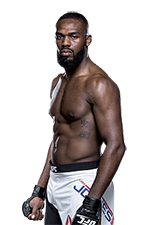 Jones deserves a tougher challenge than what OSP will bring to the table, and a heavyweight superfight against a guy like Hunt would have been more exciting for the fans. Ultimately, we should be happy Jones is still fighting, but it would have been so much better if it was a fight the fans actually asked for.